SAS Welding Services did a custom fabrication job for Lee Hembury Racing based in Somerset. 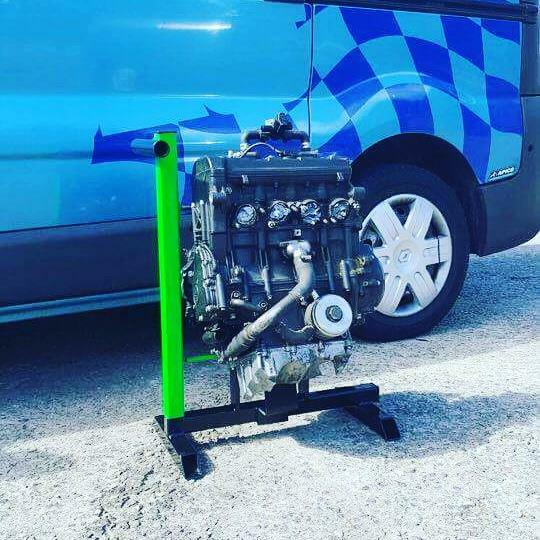 SAS are a sponsor of Lee Hembury Racing and we helped them out with a custom bike engine stand. We are always keen to support local talent! 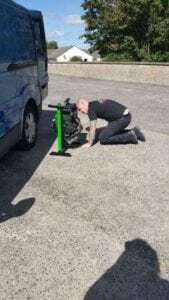 Lee now races all over the UK and did the Isle of Man TT and needed to carry a spare engine. We fabricated a perfect solution, it was TIG welded and made to look special. 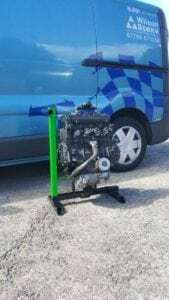 To make the race prepared engine safe in the back of the van our stand makes it secure and easy to strap down. It is also handy so you can also work on the engine when on the stand if needed. SAS like a challenge and can fabricate bespoke items. We are based in Glastonbury in Somerset, so why not give us a call to discuss your fabrication needs? Thanks for sorting out my small bit of welding most appreciated , recommend to anyone the needs welding. Exceptional service from Steve the welding ninja and his colleague at SAS -new rear X member installed on my Defender 110 TD5, deep chassis clean and Buzzweld, and a load of other bits to get Mandy through her MOT. Very competitive price too. Highly recommended. I came down all the way from Liverpool as theres not many car welders and underseal applicators around, and after going to few land rover shows and being in the g4 group they got highly recommended to me, so i took the chance and gave them job wich was a new rear galvinized chassis and to underseal me car with buzzweld application underseal wich protect alls the underneath of me car, also got them to install me new roof rack. They repaid my faith and couldnt of asked for a better job. If i ever need anymore work to any future vechiles i would deffintley give them the job thankyou very much to the guys at sas welding services. Steve is some sort of welding ninja. Did a fantastic job of TIG welding up my air con pipe on my ZT. Very impressive premises and plenty of projects on the go! A good welder is a busy welder! Highly recommended. Recommend these guys highly. Good work every time I’ve used them. Good work great comms excellent job. Land Rover chassis repairs axle repairs and fabrication work Superb ! Had a tailgate made for my trailer, enough for quad bike/ride on mower etc. Steve did it over one weekend and it's exactly what I was after, told him what I wanted to spend and he kept it in budget! Will use him again! Thank you, Steve and his team provided a prompt, reliable and efficient service in fabricating some bespoke wall brackets. We would have no hesitation in recommending them and will be using their services again in the future. Good professional welder, brilliant costumer service. Top notch job every time. Excellent work & great customer service. Highly recommended. 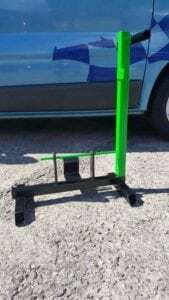 Cheers SAS Welding Services -Well pleased with your all round service to my VW T25 ( Dirty Gertee ) from quote to finish plus more .Welding spot on to spraying at the last minute. The only problem is I'm gonna have to come back now for the rest to be welded and painted Cheers Steve & Matt great work . Thanks Steve great job well done . No messing about attitude. Welding and Fabrication across Somerset, specialising in custom truck fabrication.